Beware, it is a GIANT kit! 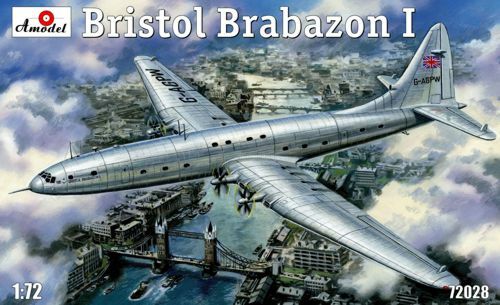 Bristol Brabazon The Bristol Type 167 Brabazon was a large a irliner, designed by the Bristol Aeroplane Company to fly transatlantic routes from the United Kingdom to the United States. The prototype was delivered in 1949, only to prove a commercial failure when airlines felt the plane was too large and expensive to be useful. Despite its size, comparable to a Boeing 767, it was designed to carry only 100 passengers, albeit in roomy conditions not generally found on modern aircraft. In the end, only a single prototype was flown; it was broken up in 1953 for scrap, along with an uncompleted second fuselage.